A4 Size 7.3 x 8.75 in. (186 x 222 mm) 8.3 x 11.7 in. (186 x 222 mm) 11 x 14 in. A3 Size 10.7 x 12.8 in. (272 x 325 mm) 11.7 x 16.5 in. MEDIUM 16.75 x 20 in. (426 x 510 mm) 20 x 24 in. 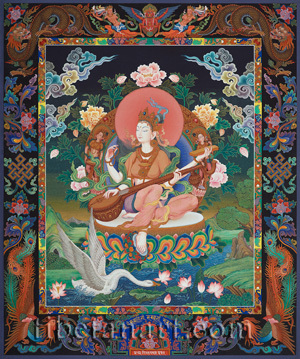 This exquisite painting of Sarasvati was painted by Dinesh Charan Shrestha in 2002. Sarasvati appears as a goddess of wisdom, knowledge and learning in both the Buddhist tradition and the Hindu tradition, where she is especially associated with the arts of music, poetry, drama and speech. Sarasvati, meaning 'elegant, flowing, or abounding with water', was once a great Indian river that dried up long ago, but its invisible presence is identified with the median nerve or 'central channel' of the 'subtle body', where the 'lunar and solar channels' unite with the river goddesses Ganga and Yamuna. Along with Durga and Lakshmi, Sarasvati is one of the three principal Hindu goddesses. As a Hindu goddess Sarasvati is the consort of both Brahma and Vishnu, and as a Buddhist goddess she is a consort and counterpart of Manjushri, thebodhisattva of wisdom. Sarasvati sits in a posture of royal-ease upon a moon disc and a multicoloured lotus, with her right foot resting upon a small lotus pedestal. This pedestal arises from the lotus-lake beneath her, where her white swan vehicle glides across the water with its intricately feathered wings raised, and the stem of a pink lotus held in its beak. Sarasvati is radiant white in colour, and her beautiful form is adorned with divine silk garments and jeweled ornaments, which include the ornate golden 'tayo', choker and chained medallions of the royal Newar Kumari, or 'living goddess'. With her lower pair of hands she plays upon the strings of her vina, which appears here in the form of a sitar. And with her second pair of hands she holds aloft a rosary and a book; the rosary symbolizing her perfect speech as mantra, and the book symbolizing her divine wisdom. Her outer aura is decorated with the forms of two offering goddesses, who play upon a horizontal drum and a four-stringed tamboura. These two instruments represent the rhythm (drum) and tonic drone (tamboura), which accompany the raga that Sarasvati plays on her vina. Her aura is encircled by lotus flowers and leaves, with colourful clouds in the sky above above, and in the lower landscape mountains, trees and rocks surround the central lotus-lake. The frame-like torana of this painting is decorated with colourful brocade patterns on its inside, while the outer torana is ornamented with the crowning image of a garuda grsping the feet of a male and female naga at the top centre. Coiling dragons appear in the upper corners, endless knots and stylized lotus motifs on the sides, and colourful peacock-pheasants in the lower corners. The ornate emblem at the torana's bottom centre is inscribed with the artist's name in Ranjani script on the lower red panel, with the deity invocation 'Shri Hamsa Vahini Sarasvati Sharanam' inscribed in golden letters above.